Whenever I go into stores to present events, the question of what needle to use for embroidery invariable comes up. My recommendation: Organ Embroidery Needles. I have used these needles for years and they are my favorite for embroidery. And I do a LOT of embroidery! I have several BERNINA machines and these needles work with all of them. Just a note here though – although BERNINA recommends these needles for machine embroidery because they have been proven to do the best job for embroidery, they also recommend that you switch back to the regular 130/705H for “regular” sewing when you are using the decorative stitches on your machine. The eye of the embroidery needle is one size larger than the shaft size. For example, a size 80/12 needle has an eye that is the size of a 90/14 needle. This small shaft keeps the needle hole small, but the larger eye accommodates the larger size of the embroidery thread and keeps the thread from shredding. 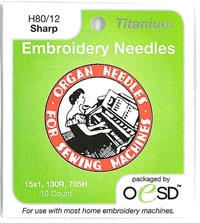 Organ Titanium Needles are the same embroidery needles, but they have a coating that serves to strengthen the shaft and tip of the needle. Although Titanium Needles are more costly, they will last an average of 5 times longer than regular Organ needles. The Titanium Needles are ideal when embroidering on denim, twill, or other heavy fabrics because their strength helps to penetrate the fibers easily without bending the needle. Pick the size of the needle according to the type of fabric you will be embroidering on. Use a heavy needle (up to a size 90) for embroidering on denim, and use a smaller needle (perhaps a 65 or 70) for lighter weight fabrics. 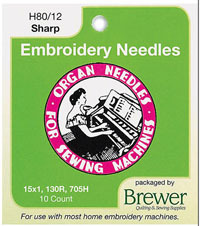 If you will be embroidering on a knit fabric, then an Organ Ballpoint Embroidery Needle is your best bet. Thank you so much for posting this great advice! So many times I get asked what size needle, and what type. I find that Organ Needles do work best, and the Titanium really are worth their money. I’m so glad others agree! I switched to Organ needles for embroidery about a year ago, and was amazed at how much better things turned out. Incredible what difference a needle can make! Hi, I am new to the 830 as I just purchased it and the embroidery unit. I live rather far from the store, can you tell me how I could get started with my embroidery unit. Also, what kids of project would a beginner start with. I’ve been sewing for a long time but embroidery is new for me. I also have not purchased the embroider software yet as I am waiting for it to go on sale. Thanks!